Sarah Rees reports from the Oakalls and Parklands . . . The Oakalls has fallen victim to a spate of car-related crimes recently. A house on Palmyra Road was broken into around 3am on April 21 and keys were taken, leading to a red Golf GTI being stolen. This followed a number of thefts, or cars being broken into, on the estate since Christmas. Councillor Caroline Spencer has been liaising with the Community Safety Officer at Bromsgrove District Council and also Police Sergeant Louise Meeson of the Bromsgrove District Safer Neighbourhood Team, regarding the problem. The feeling is that the criminals are probably from the Birmingham area and the excellent motorway network makes Bromsgrove an easy target. Further to this, the Oakalls is an affluent area and there are many expensive cars, usually parked on driveways and not in a secure garage, out of sight. One detective described the Oakalls as “a car supermarket for thieves”. Police have confirmed that German cars are a particular favourite with the thieves. Coun Spencer is eager to find out if residents of The Oakalls and Parklands would be interested in the setting up Neighbourhood Watch Groups. If sufficient interest is shown she will organise an open meeting to be held locally with Kate Hawkswell, a Community Volunteer Coordinator. Kate would advise residents on what is involved in setting up a Neighbourhood Watch Scheme. There would be an opportunity to ask questions about such a scheme. Bromsgrove District Council together with the West Mercia Police, Safer Bromsgrove and Smartwater have brought out a ‘Bromsgrove Secure Homes Initiative’. A newsletter will be produced by Coun Spencer and circulated to all residents shortly, outlining home security initiatives. * Be vigilant – report any suspicious behaviour to the local police team. Of the 25 new homes being built on the Oakalls Grange development, four properties have already been sold. On-site activity has been brisk since the opening of the sales office last month. 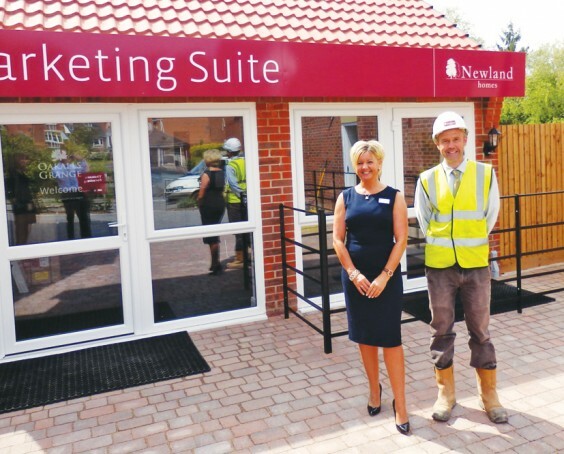 It is anticipated that footfall will increase significantly following the long-awaited Show Home opening. There will be coverage of the opening ceremony, performed by Coun Spencer, in next month’s magazine.